I had never tried Italian chili before having it at Olive Garden. 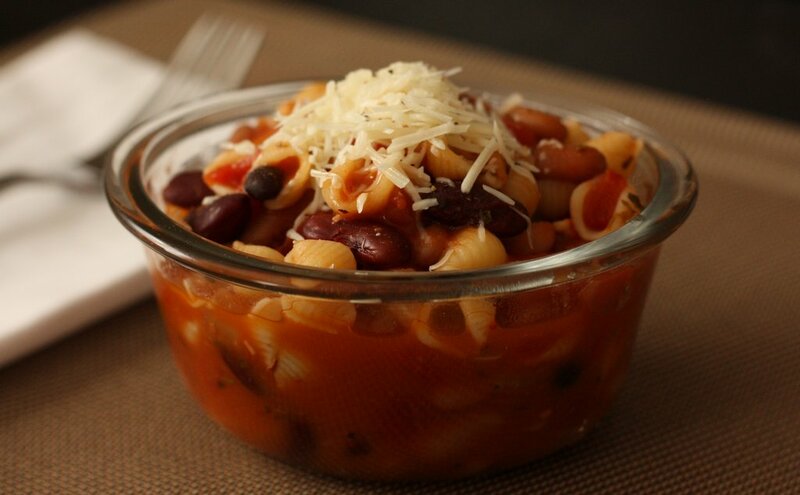 This recipe is my version of Italian chili which characteristically is beans and pasta! In my family we make an all-bean chili, so this meatless Italian chili is a natural favorite for my family! With our efforts to eat more heart-healthy, I am making more dishes with legumes and vegetables. Eating less red meat is a good thing for my dad’s heart! Since this is Italian chili, how about a song with Italian roots? “Three Coins in the Fountain” sung by Frank Sinatra was the title song for the movie of the same name which was set in Rome, Italy. Take a listen! Rinse beans in colander. Place in a large plastic bowl and cover with water three inches above the beans. Set beans aside to soak for 8-12 hours in the refrigerator. Put 6 cups water in a large saucepan. Bring to a boil over high heat. Add soaked beans. Reduce heat to medium and simmer beans for 1-2 hours or until tender. Rinse beans in colander. Set aside. Put olive oil in a large frying pan over medium heat. Chop celery, dice onion, mince garlic and julienne carrot. Add to hot oil and sauté until tender. Add diced tomatoes, tomato juice, white vinegar, and chicken bouillon cube, crumbled. Stir. Add salt, oregano, basil, thyme, and black pepper. Cook ditalini according to directions after bean mixture has simmered for 40 minutes. Add cooked ditalini to bean mixture. Simmer for an additional 10 minutes. Serve topped with freshly grated Parmesan cheese.